Standing at an astounding height of 2320 feet, Kalavantin Fort lies in the rocky regions of the Western Ghats, between Matheran and Panvel. The route to this magnificent fort leads you through lush greenery, with some rocky patches. The pinnacle is on the northern edge of the Prabal plateau and can be spotted from the Mumbai Pune expressway. You'll camp on the plateau and make your ascent the next morning. • Enjoy all the thrills of a night trek to Kalavantin fort. • Spend the night on a wide-open plateau, in tents. • Take on the challenge of Kalavantin pinnacle. • Climb to the top of the pinnacle for spectacular views of Prabalgad, Irshalgad, Chanderi and Manikgad Forts. 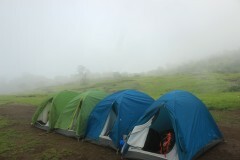 The decision of the trek leader during the Kalavantin Fort trek is final. Profanity or misbehaviour will not be tolerated during the Kalavantin Fort trek. If you cancel the Kalavantin Fort trek 15 days before the start date: 75% of the trip cost will be refunded, minus any transaction charges. If you cancel the Kalavantin Fort trek 14-10 days before the start date: 50% of the trip cost will be refunded, minus any transaction charges. If you cancel the Kalavantin Fort trek less than 10 days before the start date: no refund. The operator reserves to cancel the Kalavantin Fort trek due to weather conditions, political unrest, strikes, etc. The operator will not be held responsible for any injury, accident or loss of life during the Kalavantin Fort trek. 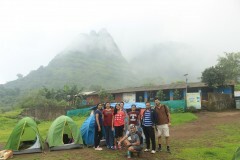 The Kalavantin Fort trek is an arduous trek that tests your endurance and is not recommended for first time trekkers. Meet the operator by 18:30 hours at Panvel Station and proceed to Thakurwadi. After a brief introduction, you'll start your trek by 19:30 hours. You should reach Prabalmachi, which is the base for Kalavantin by 21:00 hours. Eat a delicious Maharashtrian meal here before you retire for the night in a dormitory or tents. Wake up early and begin your trek by 05:30 hours from the base. It is an arduous trek with steep rock-cut stairs and a climb towards the end. You should reach the top of Kalavantin by 08:00 hours and after much exploration and soaking in the views of Prabalgad, Irshalgad and other hill forts, you'll descend to the base. You'll dig into a delicious breakfast at Prabalmachi before trekking back to Thakurwadi. You'll be driven to Panvel station from here and after this, your trip ends. Overnight in camp tents or dormitory. You'll trek from Thakurwadi to Prabalmachi and will reach in time for a delightful Maharashtrian dinner. After this, you'll retire in a dormitory or in tents on triple or quadruple sharing basis. There are washroom and changing room facilities at the campsite. Do carry a lightweight blanket for the night. You'll wake up early for a head start at the pinnacle climb. After a hot cup of tea, you'll begin your ascend and should summit by 08:00 hours. You'll descend to the base village and dig into a delicious breakfast before mapping your steps back to Panvel Station. Your trip ends here. Panvel Station is one of the busiest hub on the harbour and central zone of Mumbai's railway network. You can opt to take a train or even drive down to Panvel Station. The operator will arrange your transport to the start point of the Kalavantin Fort trek.